Dutch psych maestro Jack Ellister is back with another 7″ on Fruits de Mer Records. Last year he released an outstanding single on FdM – his self-penned The Man With The Biochopper, with its killer blend of 60s sound and spaced out vibe, backed with a cool cover of The Rolling Stones’ Citadel (CLICK HERE to read review). On this new single we’ve got a nifty trio of covers. Jack takes on The Beatles’ Within You, Without You, retaining the Eastern flavor of the original but rocks it up and plays it at a steady march-like pace. This is a totally trippy psyched out affair, and I really like the sitar-jam finale, with crowd and chant samples, followed by a brief tripped out “reprise”. Next, Jack covers Mark Fry’s Song For Wild, from the 1972 Dreaming For Alice album. 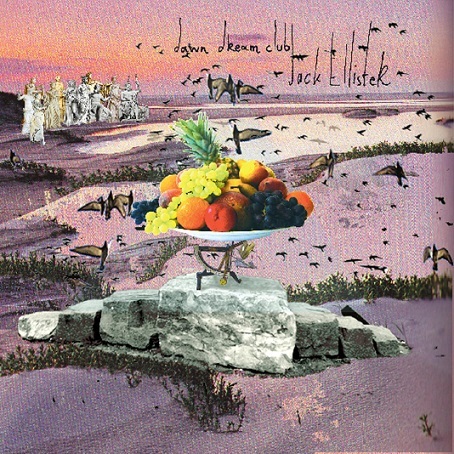 Jack is true to the lulling Folk-Psych vibe of the original, but adds a keyboard to accompany the lead acoustic guitar melody, and I like the periodic percussion fills that add an edgily threatening feel. Finally, and this is my favorite, Jack takes Pink Floyd’s Flaming and makes it a heavier, craftily effects-laden psychedelic rocker. Besides his solo singles I’ve heard Jack’s Yordan Orchestra and MYTRON projects and have been impressed with all. The promo sheet says his first solo album is completed and just needs a label to release it. I’m crossing my fingers. The single will be available mid-August, and as usual this is vinyl ONLY, no CDs or downloads. If interested you better hurry because Fruits de Mer releases sell out QUICK!